Winter Storm Watches and Winter Weather Advisories have been issued ahead of yet another winter storm that is set to impact the Midwest and Great Lakes at the start of the work week. Following a few light snow showers Sunday afternoon, most of Sunday night is expected to remain dry. There may be some patchy freezing drizzle during the evening, and then again early Monday morning as a little more warm air and moisture move northward ahead of the approaching storm system. Light freezing rain and drizzle will be possible across northern Illinois after Noon Monday, before mixing in with snow Monday evening and overnight. 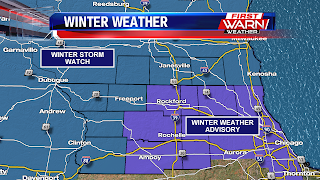 The majority of the Stateline should experience snow Monday night into Tuesday, but areas along I-88 may hold on to a higher potential for a wintry mix a little longer as warmer air tries to lift north. 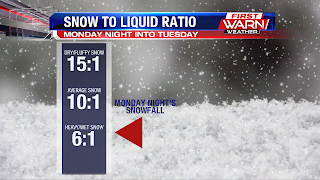 liquid ratio is 10:1 - ten inches of snow is the equivalent of one inch of water. The higher the snow to liquid ratio the drier the snow is. 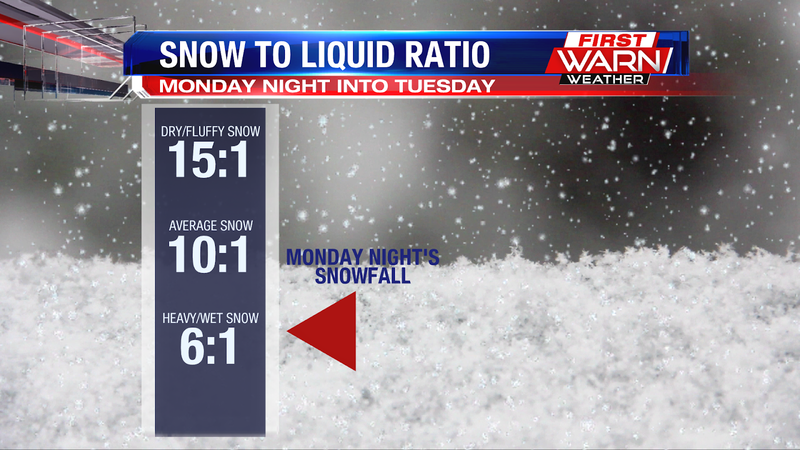 The lower the snow to liquid ratio the more heavy and wet the snow is. This snow looks to have a snow to liquid ratio around 8:1 to 6:1. This also means that it will be harder to shovel Tuesday morning. As for snow totals, area wide we should see anywhere from three to six inches, with locations near the Wisconsin/Illinois border and far northwest Illinois closer to the higher end. 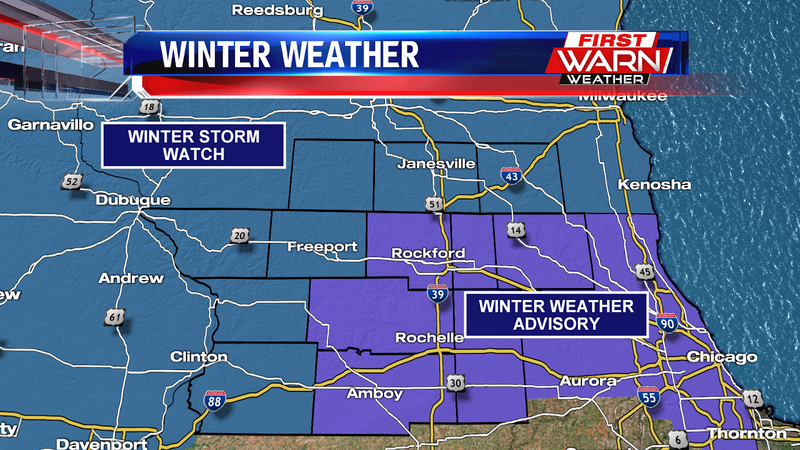 Snow showers will continue into Tuesday as low pressure passes just to the south. Northwest winds will increase Tuesday, gusting close to 40 mph during the afternoon. 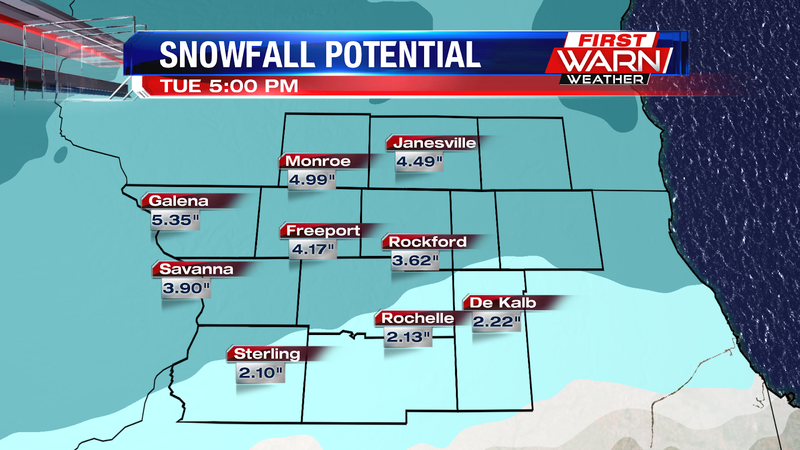 Most of the snow should be coming to an end by Tuesday evening.